A man is most physically attractive in his everyday wardrobe. Little do they know that that hanes underwear peeking through that worn out blazer and jeans ensemble, adding to the mysterious nonchalant air, are perfect ingredients to catching a certain girl's discriminating eye. What men forget, is that bank accounts and statements of assets and liabilities are mere icings and garnishments to a cake that is already oh so delectable in its simple self! Sometimes all it takes are just a pair of levi jeans or perhaps wrangler jeans topped with the most basic of tees to close the deal. 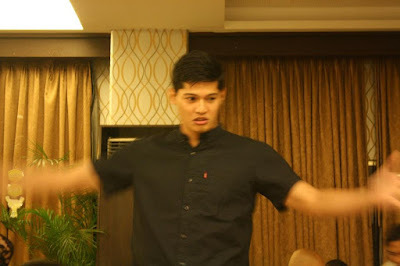 Borgy Manotoc is THE Total Package! We need more like him! Would it be too much to ask for a profound head and an articulate mouth to liven it up? This year, it is my fervent wish to meet such a man. Maybe I frequent the wrong places or I'm entertaining the wrong crowd, because these days most men seem to enjoy living up the Peter Pan syndrome. Seriously, gay men are hotter these days. Straight men beware: The threat is real!